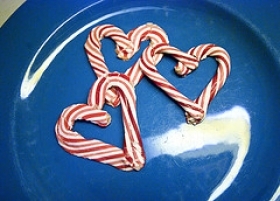 Have you made Candy Cane Cookies? 2. Mix flour and salt together in a medium size mixing bowl and set aside. 3. 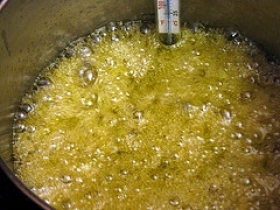 In a large mixing bowl, cream butter with an electric mixer. 4. Gradually beat in confectionery sugar and continue beating until light and fluffy (for about 2-3 minutes). 5. 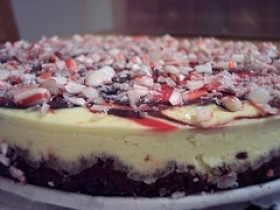 Beat in egg, vanilla, and peppermint extracts then gradually mix in the flour mixture until blended. 6. Remove half of the dough from the bowl and set aside. 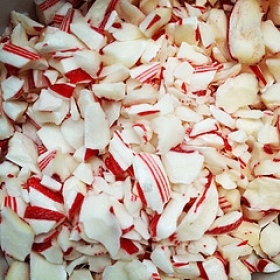 Add the red food coloring and crushed peppermint candy to the remaining dough and fold until evenly mixed and colored. 7. 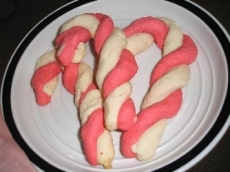 For each candy cane, scoop 1 teaspoonful of the plain dough and 1 teaspoonful of red dough. 8. Roll each dough portion between your hands to make a 4 inch rope. Twist the ropes around each other and shape into a cane shape. 9. 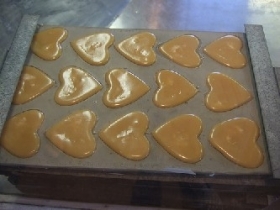 Arrange cookies on a baking sheet about 1 inch apart. Those look wonderful. I will have to make them for my niece and nephews. 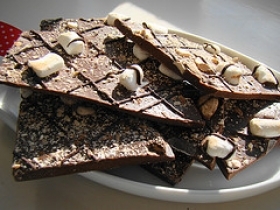 This recipe contains potential food allergens and will effect people with Wheat, Egg, Butter, Gluten, Food Color, Natural Sweeteners allergies.